When I’m looking for great edibles, I know the devil’s in the details (as well as in the calories, but I choose to ignore that). There are many brands with great marketing and branding yet lackluster products. Others are so focused on the product that they completely miss the mark on design, craftsmanship and brand awareness. Not KIVA. The brand remains dedicated to crafting intricate chocolates and mints that are just as detailed as their packaging. It’s clear KIVA cares about nurturing, enhancing and improving your life. 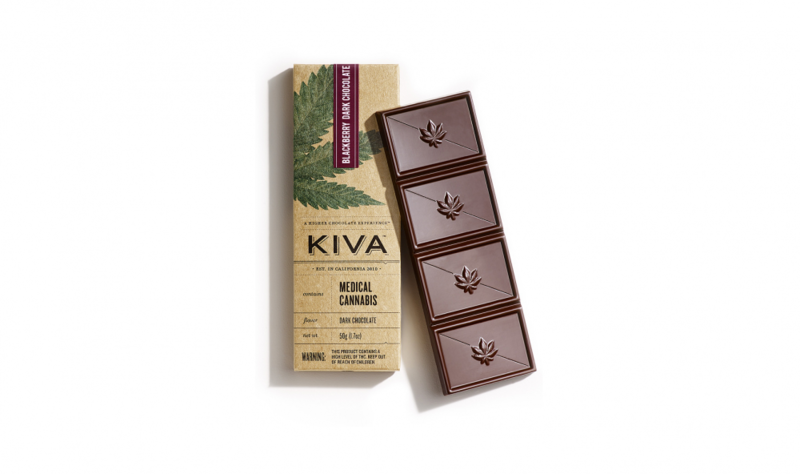 While KIVA Confections produces eight distinct chocolate bar flavors, the 100mg THC Blackberry Dark Chocolate Bar’s mix of bitter chocolate and tart blackberry sounded complex and tasty. Read on as we break down this infused candy bar and discover if it meets that expectation. Even the packaging makes the brand’s intention clear: to provide a delicious, safe, and consistent result that delights. The choco bar comes packaged in a white, resealable child-proof bag. Inside, the rectangular, recyclable box has an organic aesthetic that’s friendly, informative, rustic and modern. KIVA goes the extra mile to list ingredients, how to store the chocolate, nutritional facts, allergy warnings, dosage info, and a “best by” date (shockingly missing on a lot of products). The thick, burgundy aluminum sleeve wrapping the chocolate also relays the dosage and onset instructions. The chocolate bar itself is adorned with more branded detail and feels heavy, a sign of quality backed up by its smooth, melt-in-your-mouth texture. This 100-milligram bar is divided into 20 five-milligram pieces for accurate dosing. I enjoy edibles broken into smaller-than-average doses since I can easily adjust my amount depending on mood and time of day. Although these rectangular pieces have smaller amounts of THC, it doesn’t mean they lack flavor and effectiveness. The mix of dark chocolate and blackberry takes my palate on a flavorful journey that starts bitter and ends sweet – like almost any Sandra Bullock film in the form of a chocolate bar. Somewhere in between, I’m hit with a subtle hint of cannabis flavor and aroma that provides a nice, earthy contrast to the others. This chocolate is high quality, from flavor to texture, and tastes more like a dessert at a five-star restaurant than marijuana edible. I’d eat this even if it didn’t contain cannabis. I ate 80mg of KIVA’s Blackberry Dark Chocolate Bar, nearly the entire edible. After 45 minutes I felt a slight head change and was sailing smoothly about 1.5 hours in. This bar didn’t make my head foggy like other edibles; I was relaxed without feeling overwhelmed by those sometimes unpredictable cannabinoids. Two and a half hours in, the blackberry bar has reached its peak and I’m pretty blasted; perhaps KIVA’s 80mgs were a bit much, despite my higher tolerance. While there were lots of visual stimuli, I was happy taking a nighttime stroll and admiring the way the streetlights shone through the trees. This would have been a more functional high if I took about 30mg less because four hours after ingesting I passed out on my bed. Hell, it’s 1:30 a.m., so why not? KIVA’s Blackberry Dark Chocolate Bar (around $22) is an enjoyable edible that offers a versatile, potent high. The superior chocolate quality helps support the higher-than-average price tag. Before regulation, KIVA’s chocolate bars were nearly twice as strong for practically the same price. What you’d see from a high-quality chocolate bar on the shelves of an upscale supermarket. The simple, earthy design is easy to trust. Bar stays well protected in the bulky child-resistant zip bag. Frontside indicates the flavor, net weight, THC content, and number of pieces. Backside features a full information panel that includes cannabinoid content, safety and allergy warnings, ingredients, dosages, nutrition info and more. Would have liked to see a stickered QR code on the package to confirm lab test results and what strains were used. Each 100mg bar contains 20 pieces at 5mg each. Portions are indented for easy and accurate dosing. If you desire smaller increments, use a sharp knife to cut each piece into four segments. This “natural” colored box shouldn’t be the cause of unwanted attention. Inner burgundy package makes this bar even more discreet. Chocolate bar itself has cannabis leaves printed on it; this isn’t noticeable without close examination. Delicious blend of bittersweet dark chocolate with sweet, fruity blackberries. Smooth mouthfeel, just as chocolate should feel. No particulate matter, nothing granular, just a sweet and smooth dissolve. Chocolate bar didn’t leave any melted chocolate on my fingers after eating. Subtle head-change crept in about 45 minutes after finishing 80mg. Didn’t make my head foggy as some edibles do; relaxing without feeling overwhelmed. Would have been a functional edible if I took about 30mg less. Peaked at two hours, passed out in my bed by the fourth hour. Solid bar of blackberry chocolate; use in any recipe that calls for dark chocolate. Perfect for melting down at a low temp to drizzle over ice cream, cake or brownies. Could chop up the pieces for chocolate chips; larger pieces for s’mores and even a mole sauce for a savory, slightly berry Mexican dish! I return to KIVA time and time again for consistent results. Accurate dosing, great flavors and positive effects – it’s become a cannabis brand name for a reason! $22, isn’t a bad price for a delicious, potent and consistent edible. Chocolate quality helps to justify a higher price point. Pre-regulation, these had nearly two times the potency for the same price (keeping up with regulations gets expensive). If you want a delicious, artisanal and effective edible for about 20 bucks, you can’t go wrong with KIVA’s Blackberry Dark Chocolate Bar. Its high quality, delicious flavor and smooth texture feel like I’m eating a swanky dessert at L.A.’s famed Chateau Marmont. More potent than I anticipated, this KIVA bar will make you relaxed without feeling overwhelmed all while making your taste buds dance with fruity delight. If you live in the Los Angeles area and are ready to stimulate your taste buds with KIVA’s Blackberry Dark Chocolate Bar, click here to see if Nugg Club delivers to your address!